Ranolazine-mediated reductions in body weight are not required for ranolazine’s salutary actions on NAFLD and dysglycemia. (A) Pyruvate tolerance and associated AUC. 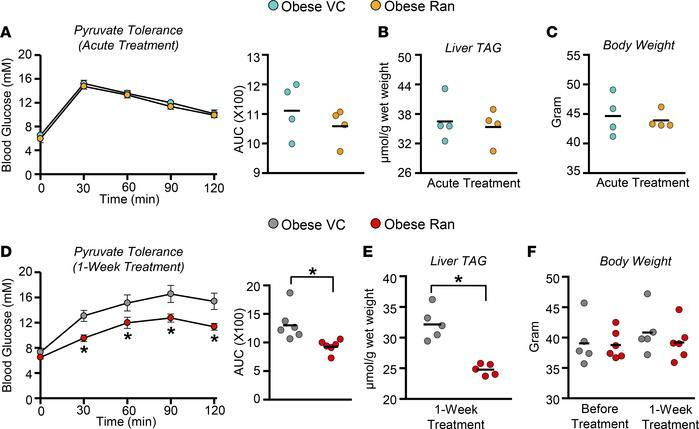 (B) Liver TAG content and (C) body weights in obese mice treated acutely with either vehicle control (VC) or ranolazine (Ran) (n = 4). (D) Pyruvate tolerance and associated AUC. (E) Liver TAG content and (F) body weights in obese mice treated with either VC or Ran for 1 week (n = 5–6). Values represent means ± SEM. Differences were determined with an unpaired, 2-tailed Student’s t test or a 2-way ANOVA, followed by a Bonferroni post hoc analysis. *P < 0.05, significantly different from VC-treated counterpart.